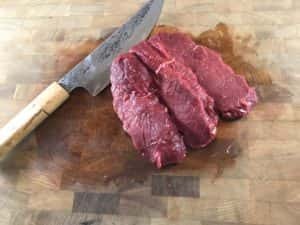 Moose sirloin steaks are fantastic choice for grill. We know that fat is flavor and moose is lean. How do we get it right then? Trick is to aim at young moose. It tends to be tenderer and rewards you with juicy treat. Just remember to cook it medium rare. I have grilled and smoked moose many times. This time I had 2,65lb (1,2kg) sirloin from a young female moose, thus a calf. With this size of a sirloin, the calf was already more than one year old. Still young, but the cut was sizable. Perfect! I started preparations by removing membrane and thin layer of hard fat. …and spread kosher salt all over before placing steaks into a fridge for few hours. This is dry brining. While salt penetrates the meat, it helps retaining water inside when cooking. 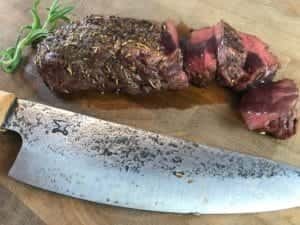 When I took my steaks out from the fridge, I seasoned them with rosemary and thyme. Next, I heated up my Monolith Kamado Grill to 300°F (150°C). With lump charcoals of course. I like to cook my steaks by reverse sear. This method turns the traditional “sear first, cook then” upside down. In practice, I placed moose sirloin steaks first on top of the indirect heat and cooked them up to 113°F (45°C) internal temperature. Then I moved steaks on top of the direct heat for searing both sides, until internal temp reached 122°F (50°C). Once steaks were in target temperature, I took them out and put in foil for a rest. Internal temperature carries over few degrees, so when I was ready to serve them, they were at perfect 131°F (55°C). Some roasted potatoes and red wine sauce to go with.